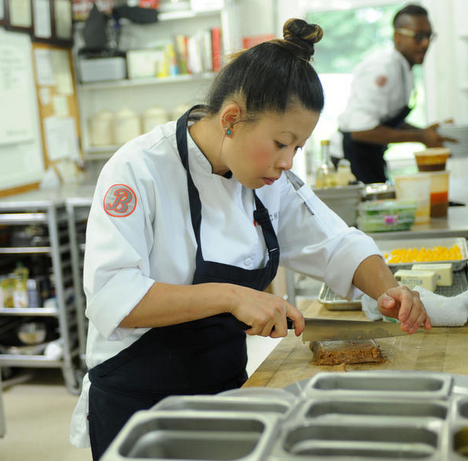 For the Quick Fire Challenge, the chefs were taken back to their college roots. We are introduced to Andy Cohen and his college roommate and wait to see what the rest of the challenge has in store for the chefs. With Andy and his college buddy as guest judges, the obvious challenge was to cook what most college students survive off of: ramen! Each chef was paired with a college student. From there, they were given a bag of what this student had in their dorm room food wise. This left many chefs with a bunch of obscure ingredients. This included half-opened jars of salsa, processed cheese, and a whole lot of chips. Mei didn’t fair to well with her ramen and spicy tomato miso sauce with sushi shrimp and nori and was left on the bottom. Doug joined Mei with a ramen in coconut pineapple water broth with ham, egg, grilled tofu, bell pepper, and sunflower seeds. Sounds like a mouthful. George, Gregory, and Melissa filled out the top. Melissa took the win with a roasted chicken mac and cheese carbonara style ramen. Unfortunately there was no immunity left in the game. Still, $5000 isn’t that bad to walk away with. For the Elimination Challenge, the contestants were given a remote and told to press play. The TV started to play a montage of Julia Child and her best moments in cooking. 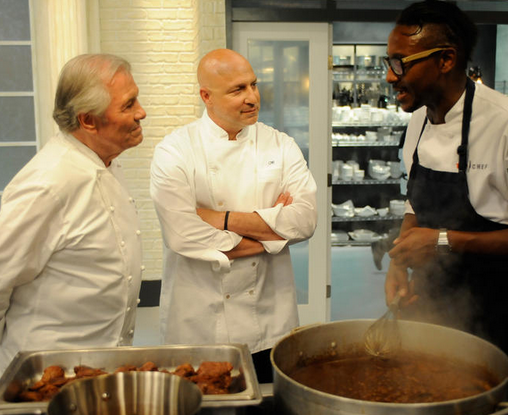 After the montage, Jacques Pépin walked in to further explain what was going on. The challenge was simple. The chefs had to cook a dish to honor Julia Child. The chefs sat down and drilled Jacques Pépin with questions. He described how he was first introduced to Julia and how he cooked dinner for her. “She’s was a big women with a terrible voice,” said Pépin. The chefs then headed to Whole Foods to gather the ingredients they needed in order to honor Julia. Back in the Top Chef kitchen, the chefs are were quick to get to work. George started off struggling to get his veal in his pressure cooker. Melissa was busy braising her short ribs, hoping they will be tender enough in the three hours. Gregory made coq au vin with glazed carrots. He had never made this dish so he was taking a huge risk cooking. Mei made duck a l’orange with her own spin. She added some five-spice in for an Asian twist. Doug made whole roasted loaves of foie gras. HUGE RISK. Tom and Jacques were impressed by his undertaking and could not wait to taste his dish. 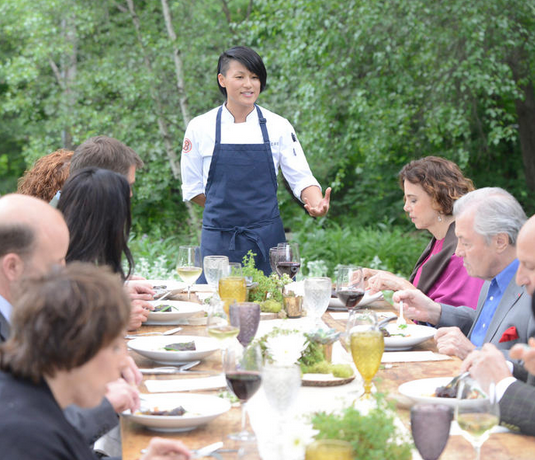 The judge’s feedback was mostly positive for Gregory and Mei’s dishes. Tom had some criticism on George’s veal and thought it wasn’t cooked properly. Melissa struggled to get the perfect seer on her dish, which the judges picked up on quickly. Doug’s huge risk did not pay off. His foie gras was over seared, but uncooked. Major mistakes all around. With no surprise, Gregory and Mei had the top dishes. Mei edged out Gregory and took the win. That left Doug, George, and Melissa in the bottom three. The judges had the same complaint across the board; the protein in their dishes was simply not cooked correctly. At the end of the day, Doug was sent packing. Melissa and Gregory just made it into the final four. 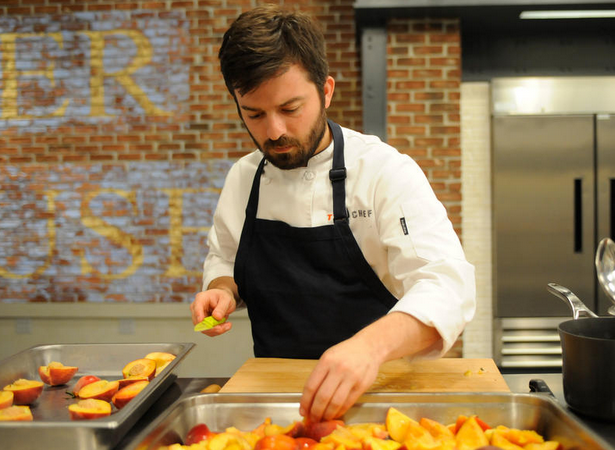 The risk that Doug took did not benefit him in the long run, but hopefully he can pull through in Last Chance Kitchen to get back into the competition. I was really surprised to see Doug go home. I definitely thought he would be able to overtake George in the kitchen and make it to the final four. Gregory, Mei, and Melissa definitely earned there spots in the final four. Right now, I would guess that the final two would be Mei and Gregory. Guess we will just have to wait until next week to see who it really will be!